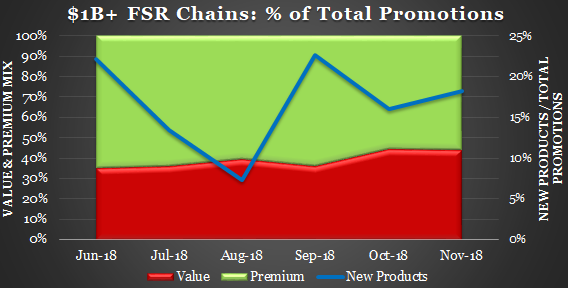 While a modest 4Q:18 comp growth outlook for the $1B+ chains reflects expectations for an apparent FSR sequential slow-down, on a 2-year comp basis 4Q:18 FSR is expected to be up +0.4% over 3Q:18. 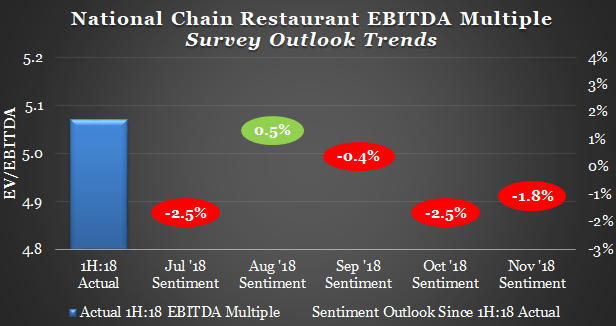 2-year stacked 4Q comp outlook for all $1B+ chains is expected at +3.8% vs. +3.7% for 3Q. 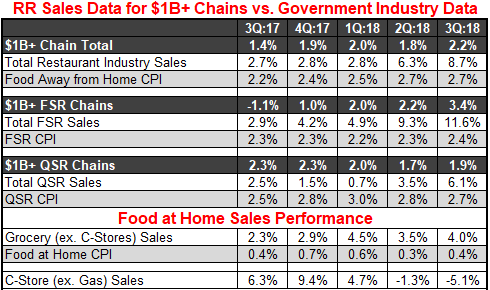 In any case, preliminary government data shows Total Foodservice sales slowing in September and October after peaking in August. QSR eased-up on value for the 2nd month in a row, while FSR maintained a high level of discount offers. 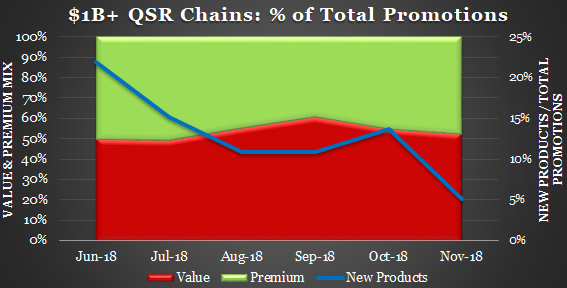 Promotional price points edged higher with an increase in $6 QSR value offers and a decline in $5 deals (which may have been prompted by McDonald's introduction of the $6 Classic Meal Deal). FSR increased offers in the $10 - $13 range while decreasing its mix of $6 & under deals. 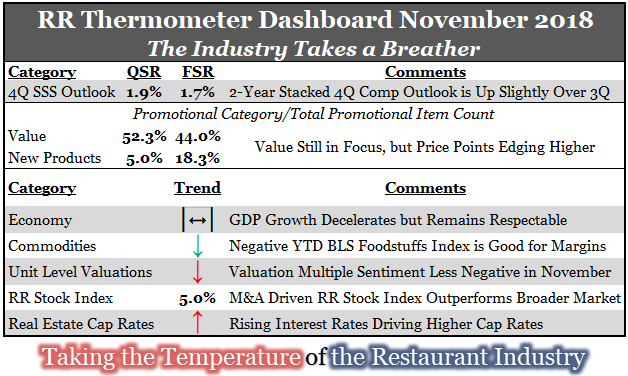 Product innovation fell to an LTM low for QSR, but increased for FSR with significant menu additions at Corner Bakery, Buffalo Wild Wings, Outback, and Ruby Tuesday. 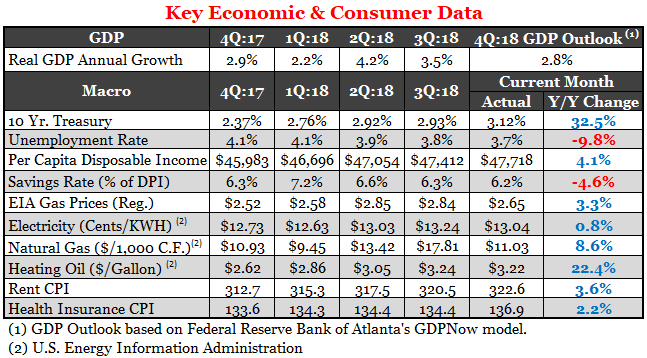 4Q GDP Now growth outlook was trimmed to 2.8% from 3.0% last month as economic activity continues to decelerate from 4.2% in 2Q to 3.5% in 3Q. Pros: increasing disposable income; record low unemployment rate; strong consumer confidence; and lower tax rates for 2018. Cons: Higher gas prices (starting to moderate due to falling oil prices) and rising interest rates. October was cooler and much wetter (6th wettest in 125 years) than average. The BLS Foodstuffs Index fell -3.4% in November (driving the index negative for the YTD period) with potatoes & cheese reaching new LTM lows. 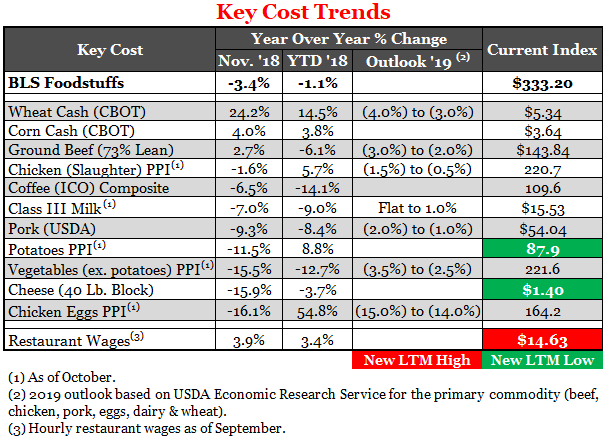 2019 USDA outlook is favorable with both the egg & chicken price outlook revised lower during the month. Franchisee EBITDA valuations remain under pressure due to unit level margin challenges driven by rising labor costs, creeping interest rates and increased supply. 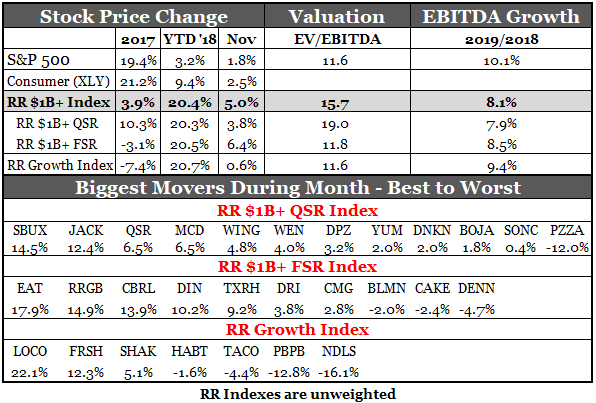 RR's $1B+ Stock Index continues to strongly outperform the broader market and is now up +20% YTD vs. just +1.8% for the S&P 500, reflecting an active M&A market for restaurant companies with Jack in the Box announcing that it is exploring strategic options. 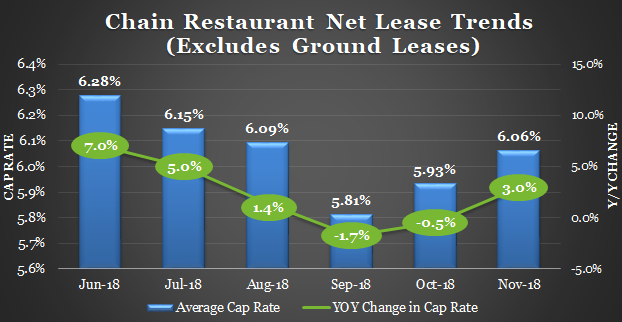 Smaller, higher growth restaurant stocks continue to under-perform their larger peers possibly suggesting less M&A interest at this point in time. Cap rates continue to trend-up as rising interest rates are starting to weigh on commercial real estate valuations. While the number of transactions declined 22% y/y in November, December is expected to be a strong month as investors look to close deals before year-end.